The 2019 Birthday Rides start on the 141st anniversary of the founding of the Cyclists’ Touring Club and are based at the Wyboston Lakes Resort, 2 miles south of St. Neots. The site has 350 acres along the River Ouse with a range of leisure facilities. It is on the historic borders of Bedfordshire, Cambridgeshire and Huntingdonshire each of which provides many miles of easy cycling. 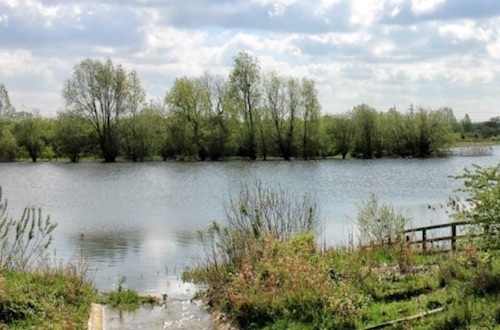 Attractions nearby include Grafham Water and the towns of St. Neots, Huntingdon and St. Ives. Further afield are Cambridge and its colleges, Burleigh House, Woburn Abbey with its Safari Park, Duxford and Shuttleworth aircraft museums and National Trust properties at Wimpole Hall and Houghton Mill. Choice of rides. Evening: Entertainment. Choice of rides. Optional coach trip to IWM Duxford. Evening: Entertainment. Depart: Vacate rooms and Campsite by 11.00 am. The accommodation for six nights will be based at The Willows Training Centre, Wyboston Lakes Resort, Great North Road, Wyboston, MK44 3AL. Tel: 0333 7007 667. This is part of the Wyboston Lakes Resort which has several leisure facilities on site. The main entrance is a left turn from the southbound carriageway of the A428. We have arranged for an extra access, for cyclists only, at the southern end of the site, near a ramped footbridge over the A1. Rooms are located in both the Willows Training Centre and the Woodlands Events Centre. Single, double and twin bedded rooms are available. Some double bedded rooms are suitable for wheelchair users. All rooms are en-suite with a shower. Bed linen, towels and toiletries are provided. Access to bedrooms will be by key. Lifts are available and there is good access for those with limited mobility. Please show any special requirements clearly on the Booking Form. All residential accommodation will be on a half board basis. There is no self-catering accommodation available. Meals will be self-service. Breakfast (from 7.00 to 8.00 am) will have English and continental options. The three course evening meal (from 7.00 to 9.00 pm) will consist of a starter, main course and dessert plus tea and coffee. If you have any special dietary requirements, e.g. vegetarian, diabetic or gluten/wheat free meals, please indicate these under special requests on the Booking Form. Meals will only be served to those wearing the appropriate identification. Coffee/tea making facilities are available in the rooms. There is ample free car parking close to both the Willows Training Centre and the Woodlands Event Centre. Secure cycle parking under cover will be available. The Willows Training Centre contains the dining room, the venue for the social events and the bar (open each evening). The Rides HQ will also be based here. Please note that pets are not allowed on any part of the site, and smoking is permitted only in a designated area (see Bookings Conditions, Clause 14). The campsite will be next to the Woodlands Events Centre. Tents will be located on the grass area, caravans, motorhomes and campervans will be on a gravel hardstanding. All other motor vehicles must use the adjacent car park. Only small camping stoves will be allowed on the campsite. There is no lighting on the campsite so you are advised to bring a torch. Plenty of bins will be provided for refuse and will be emptied regularly. No special security arrangements will be in force at the camping areas but there will be volunteers on site during the day. Campers will have use of the secure cycle parking. Toilets, showers and drinking water will be available in the Woodlands Events Centre. Campers have a choice of half board, dinner only and self-catering options. Members of groups wishing to camp near each other are advised to book at the same time and indicate clearly the name of their group. We will do our best to meet such requests although adjacent pitches cannot be guaranteed. Facilities available on the 350 acre site include a health spa, golf course and driving range, water sports and (motor) off-roading. These may be booked on site at extra cost, subject to availability. Part of the site is a Nature Reserve. Wednesday 7 August: to Bletchley Park, the once top-secret World War II home of codebreaking. 9.00 am to 5.00 pm, additional cost £33. Friday 9 August: to IWM Duxford. Walk through the same hangars and buildings as those who served at RAF Duxford plus over a century of aviation on display by the Imperial War Museum. 9.00 am to 5.00 pm, additional cost £30. You are strongly advised to take out insurance to cover your loss in case of cancellation. Please refer to the Booking Conditions, Clause 6. Prices vary according to the accommodation and meal plan chosen as detailed below. The full amount is payable in advance. If we do not receive a minimum of 250 bookings by 1 April 2019, we reserve the right to cancel the Birthday Rides and return all monies to you. Should you be forced to cancel your booking for any reason you must notify us in writing. Cancellation charges will be charged in accordance with clause 3 of the Booking Conditions. The following is for information only and does not form part of the contract. Registration will be in the Willows Training Centre from 3.00pm – 6.00pm on Monday 5 August 2019. PLEASE DO NOT ARRIVE BEFORE THIS TIME. Please bring your Booking Confirmation with you. Should you be delayed or unable to arrive on the Monday, please contact bookings@birthdayrides.org or telephone 07926 693 066 to discuss other arrangements. There will be no refund for missed meals. Local members and helpers will be on hand to show you where to register and where your accommodation or camping pitch is. You will be issued with appropriate identification which should be worn at all times. Ordnance Survey 1:50,000 maps 142, 143, 153, and 154 cover most routes. Hard copies and .gpx files will be available. We shall endeavour to have a vehicle available on riding days to meet emergency pick up requirements (in the event of an accident or a serious mechanical failure). We reserve the right to charge users of this service. A touring cycle, hybrid or lightweight ATB is suitable for the rides. You should ensure your cycle is well maintained, paying particular attention to wheels, tyres and brakes. You should carry sufficient spares and tools during the rides to deal with punctures and minor repairs that may arise. There is a cycle shop, Wheelers, at 34 St. Marys Street, Eynesbury, St. Neots, PE19 2TA, (01480 476529). You will need a rackpack, saddlebag or panniers to carry any spare clothing (don’t forget the waterproofs!) and food. Refreshment stops may be sparse in some parts, so a water bottle and emergency rations are always useful, especially on the longer rides. Cycle helmets are not compulsory.